Overwatch's new hero, Ashe, is now playable across all versions of the game. Not to worry if for some reason you aren't interested in playing as a stylish bandit lord with a cool hat and an old repeater rifle, because four other heroes got some significant changes in the new update as well. Roadhog mains, rejoice! 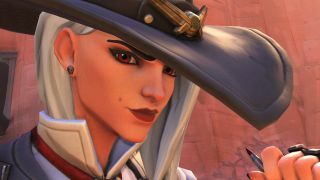 Ashe was first introduced at Blizzcon 2018 with a flashy animated short (that also showed some of her history with cowboy gunslinger McCree) and she joined the PC versions' Public Test Realm soon after. It's been a little less than two weeks since then, so not a bad turnaround time as far as new heroes go. Remember how Blizzard dragged out the Sombra teases for the better part of a year? I won't run down Ashe's abilities again, but the basic gist is that she's a damage-focused hero with a hitscan gun that's slower than Soldier 76's assault rifle but faster than McCree's revolver. Or think of her as Ana but with better mobility and actual bullets instead of healing/hurting syringes. Oh, and with a hulking robot friend for an ultimate. That's key too. What about those changes to other heroes? They aren't anything as sweeping as a(nother) Mercy or Symmetra rework, but they're still substantial buffs to four of Overwatch's original heroes: Mercy's ultimate now charges faster and does a little more healing; Symmetra's primary attack - you know, that blue beam thing - now charges up 20 percent faster; and Reaper's shotguns have a more predictable spread of pellets with 10 percent more life steal. The big winner in the eternal cycle of buffs and nerfs this time is Roadhog. Let's talk Chain Hook: to make it harder for targets to break free after being hooked (the best feeling for the victim and the worst feeling for 'Hog), the ability now heavily reduces its target's momentum and starts reeling them in .2 seconds faster. Chain Hook also now begins its cooldown as soon as you use it, meaning you won't have to wait longer just because your last target was a long way off. Roadhog's adaptable Scrap Gun got some changes too: the spread patterns for both its close-up primary fire and delayed-burst secondary fire were adjusted to put more pellets at the center and overall spread randomization was cut by half, making for more consistent damage at all ranges. His Whole Hog ultimate can now knockback targets up to 25 percent harder - this brings it closer to the old days when its pushing power was actually supercharged by a glitch - and its horizontal recoil has been lessened. Have fun landing more of those devastating hook-blast-punch combos! See more of what's coming down the pike at Blizzard with our highlights from BlizzCon 2018.